On the high street fidget with uncertainty. Nesting habits are well known to us. You have gone into the mountains. And you will not return. 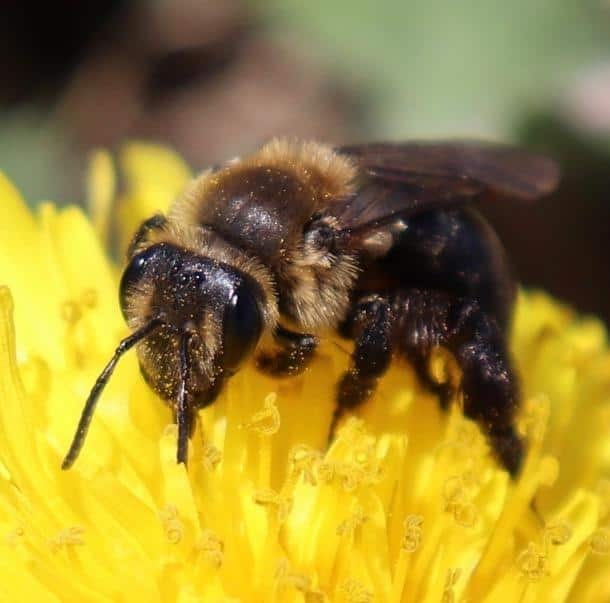 Andrena vicinia, one of the 14 declining wild bee species identified in this study (‪(‬Photo Credit: Molly Jacobson). This poem is inspired by recent research, which has found a dramatic decline of 14 wild bee species across the north-eastern United States. Bees and other pollinating insects play an essential role in ecosystems, with approximately a third of all food production depending on their pollination. In recent decades, with agricultural expansion and land-use change, there have been notable bee and pollinator declines documented across Europe and North America, which has serious implications for global food production. However, while studies have highlighted widespread bee declines, there has been a relative lack of detailed information on local communities and individual species. In this new study, researchers analysed 119 wild bee species within New Hampshire, USA, over 125 years (1891–2016) using data from local museum records. By analysing characteristics such as habitat preferences, elevation, and latitude as well as social behaviour over this time period, the researchers found that 14 species of wild bees were declining at a statistically significantly rate. Of these 14 species, seven of them also demonstrated habitat shifts towards higher elevations and more northern latitudes. This is consistent with other research that has previously shown many non-migratory species are moving further towards the poles because of global warming. With the continuation of climate change, monitoring the habitat shifts in these wild bees will be important to help with appropriate landscape management, crop production and conservation policies.